Just in case you thirst for more eco-Halloween, (You do, don't you?) 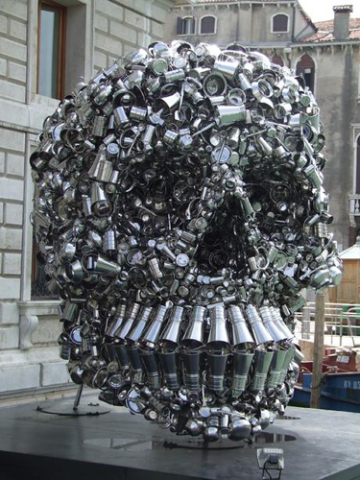 I found another trash to treasure skull that is worth the time of day to see. It is huge and incredibly innovative. Take a look below. 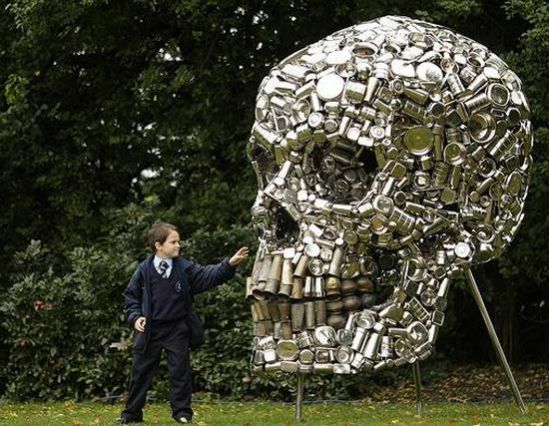 The skull, created by Indian artist Subodh Gupta, is made of reclaimed kitchen metal: pots, utensils and cans. As you can see it stands much taller than the boy in the picture. Will the boy touch the skull? This giant skull is the kind of skull that if it was your it would help you win the Halloween decorating contest against your neighbor. It would also help attract more treaters to your door and of course your house would be the coolest all around because of it. Unfortunately, this skull is also the kind of skull your wife would kick you out of the house for after placing it in the front yard. The good news it looks like you can nap under it and it will protect your from the heat of the morning sun and maybe even rain.